← Americans are getting less than 2 servings of vegetables! Are you one of them? With the arctic temperatures this past weekend, and a rainy 8 mile long run on Monday, all I wanted to eat was a big bowl of spaghetti. For me pasta can be a slippery slope. I tend not to be able to stick with the 1/2 cup recommend serving size, and have yet to find anyone who can. My dilemma with pasta is always volume vs calories. When it comes to pasta my stomach is like a bottomless pit! Now there are some fabulous whole wheat versions of pasta out there like Dreamfields, Ronzoni and 365 Everyday Value Organic Whole Wheat Pasta. These types of whole-wheat pasta are made from “whole durum wheat” or “whole semolina.” Both described as coarsely ground whole durum wheat, which is rich in protein and gluten and fiber. These whole grain pasta still were not going to solve my desire for a large volume of food at my meal, while keeping my calorie count low. What’s a girl to do? 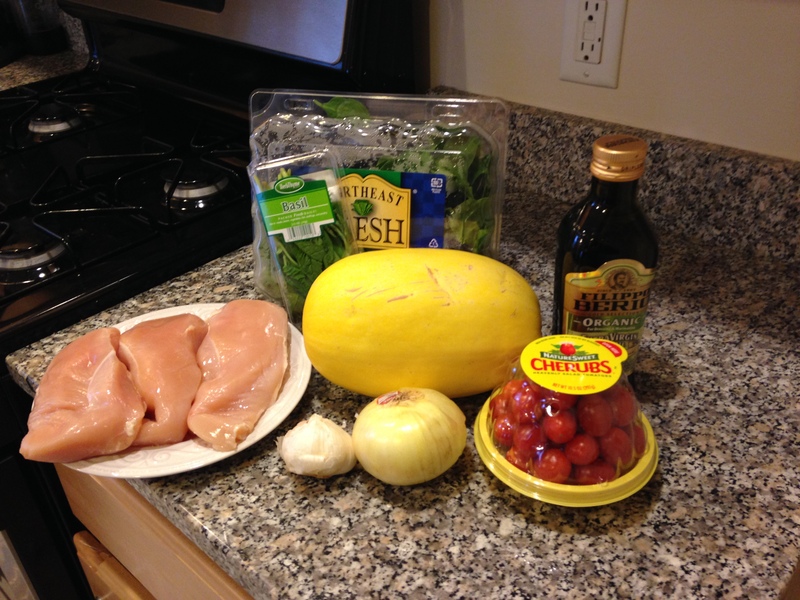 Well I took a hint from my gluten free eaters out there and gave spaghetti squash a try! It is the prefect solution to my volume vs calorie dilemma. Each cup of the cooked squash contains only 42 calories and 10 grams carbohydrate (3g fiber) compared to my 1 cup of Dreamfields, pasta where 1 cup (2 oz) is about 190 calories and 41g carbohydrate (5g fiber). That is 150 calorie save per cup! 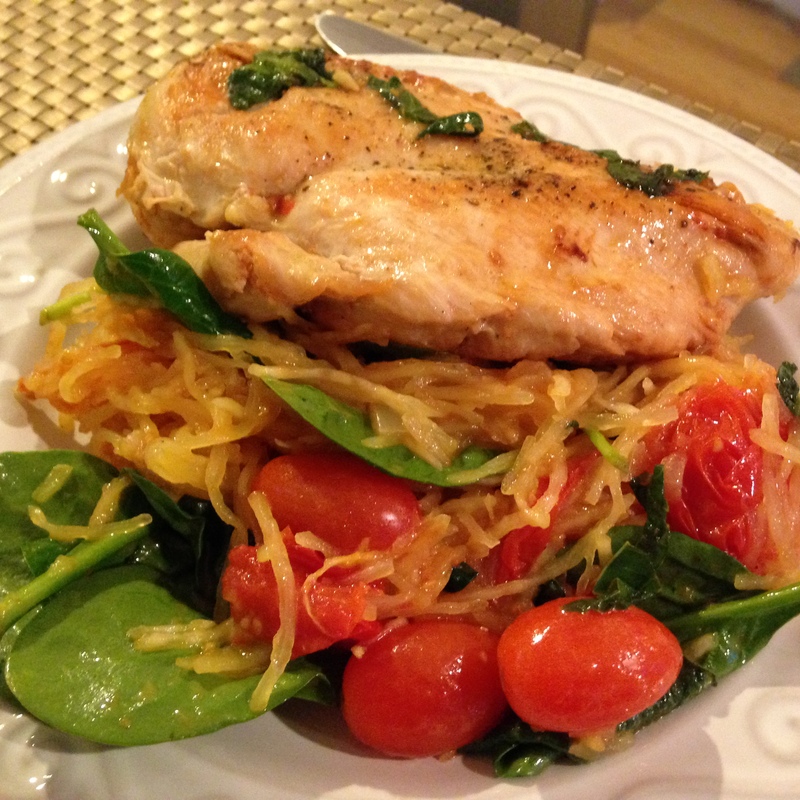 There was a recipe on my Pintrest board that I was dying to try and to “lighten” up from Menu Musings of a Modern American Mom, that goes prefect with spaghetti squash. This has to be one of my favorite creations, comfort food that I can eat larger volumes without going over board on calories, a dream come true! And for all my vegetarians out there, the sauce is so good so just skip the chicken, you could add white beans for a little extra protein. Step 2: Using a mallet/meat tenderizer, pound the chicken breast. Season with salt & pepper. 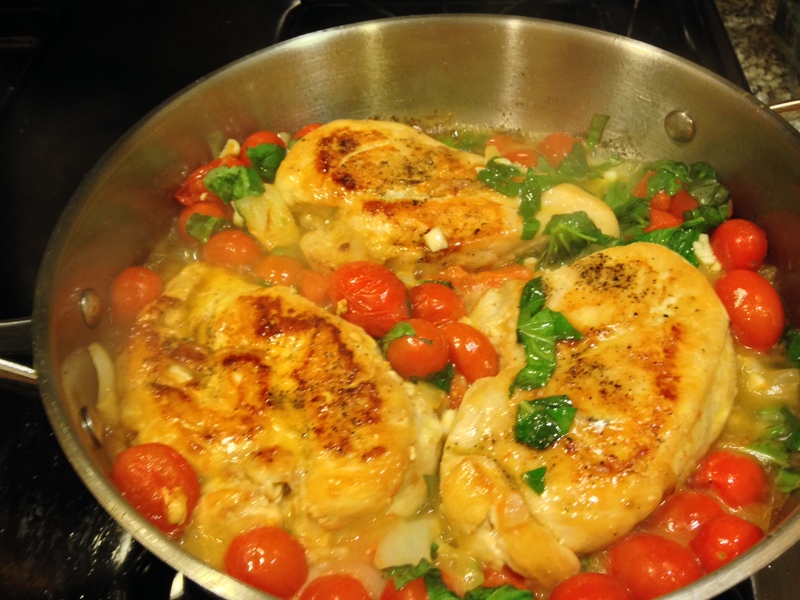 Place in hot skillet with 2 Tbps olive oil. Cook chicken about 4 minutes on each side, until cooked through. 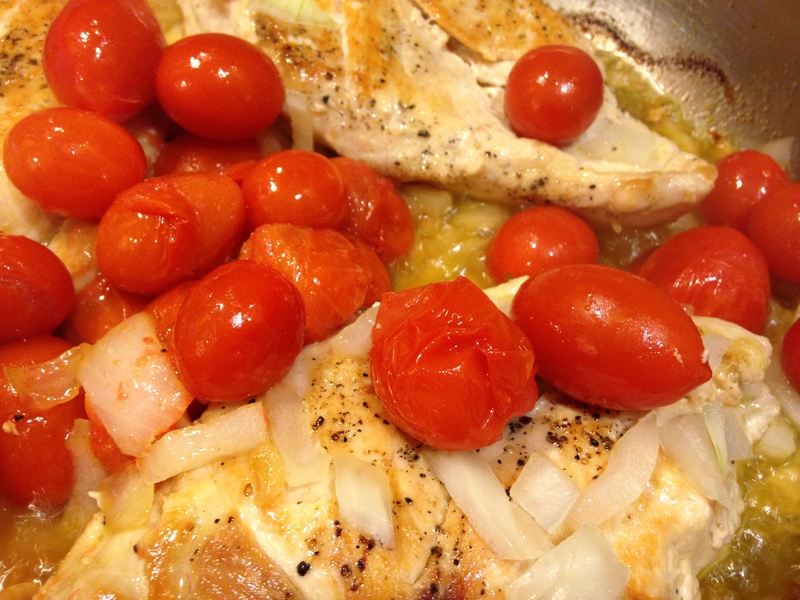 Step 3: Add onion, and tomatoes to skillet. 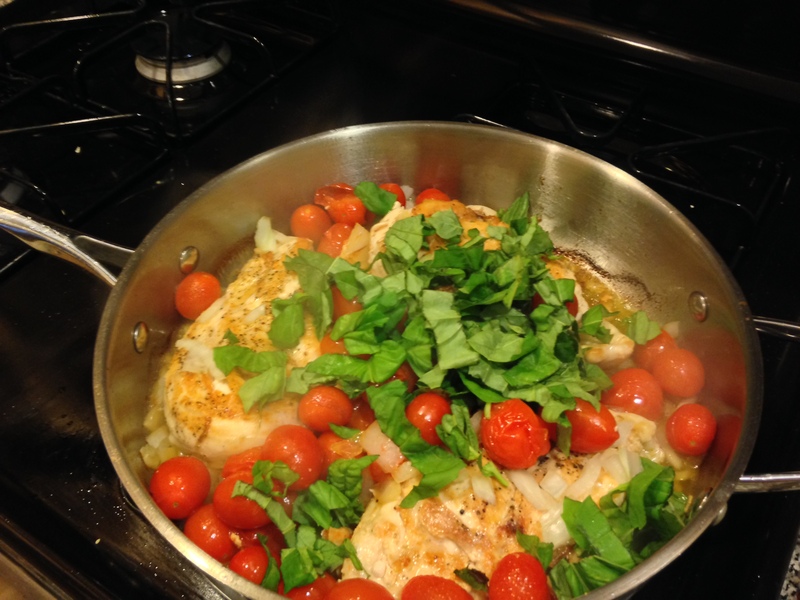 Cook until tomatoes start to blister. Step 4: Add Basil and Garlic. 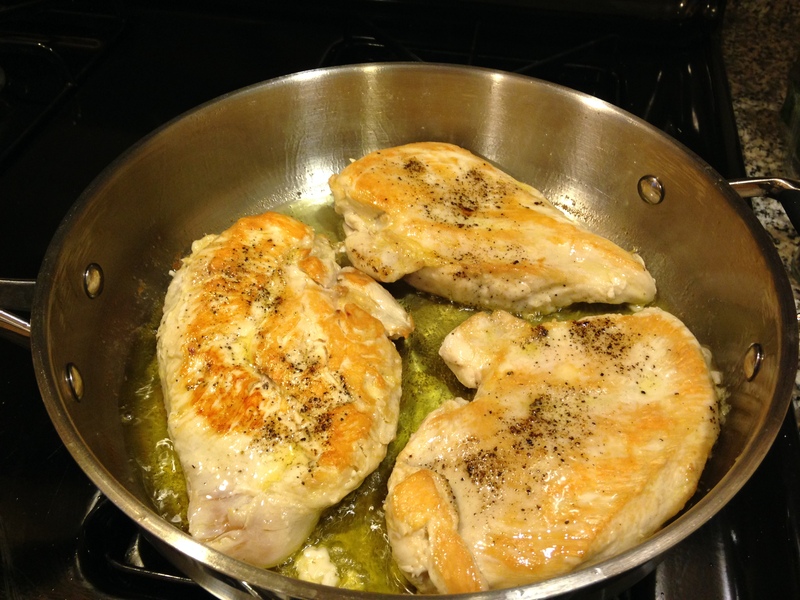 Add 1 Tbps olive oil to create more sauce. 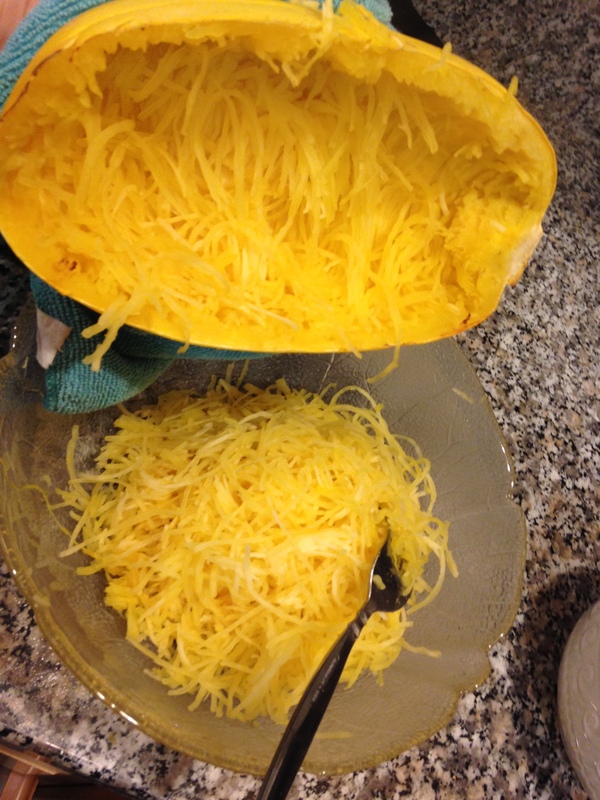 Step 5: Remove from heat and combine with Spaghetti Squash. Step 6: Incorporate baby spinach and enjoy. This entry was posted in Quick & Healthy and tagged Cooking, Dinner, food choices, Healthy Advent Holiday, High Fiber, Quick, vegetables, Vegetarian, weight health, Weight loss. Bookmark the permalink.